Note: There are two versions of this program on the same DVD: 63-minutes and 53-minutes. In Japanese with English subtitles. Tokyo is a digital metropolis and wellspring of spectacular pop culture, its commercial crossroads carpeted with people day and night. 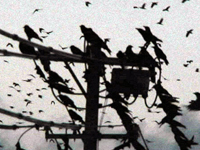 Above them, watching from perches on buildings and power lines, are more than 20,000 crows. As their numbers soared in recent years, Tokyo fought back: trapping them, destroying nests, and securing trash. The crows adapted; they are among the smartest of animals. The 13 million people of Tokyo now live alongside them in a stalemate. TOKYO WAKA tells this story, and a larger one as well. A Buddhist priest comments on garbage as the remnants of desire; a gardener considers the relentless persistence of nature amidst urban grit; a homeless woman talks about forging community in her tent village deep in the corner of a city park. TOKYO WAKA gives these smart, opportunistic crows their due, but the film is ultimately an episodic and discursive poem about the life and culture of Tokyo, one of the great cities of the world. "Tokyo Waka is one of the most beautiful films I have seen in years. Visually arresting and poetic in its composition -- any number of stills would make classic photographs -- it evokes the soul of a great city through its ancient bond with a large tribe of resident Jungle Crows. The crows, gregarious, complex, smart enough not only to use tools, but to use US as their tools, nearly steal the show, but in the end their story is braided seamlessly with that of the human animal that has built the modern jungle both call home. This is a masterwork." "An engaging film that welcomes you into the evolving relationship between human and crow cultures. You feel the Japanese perspective and understand the crow's, and you come to see our shared heritage as one deeply molded by the natural world." "In Tokyo Waka, the huge black crows that swarm over the city of Tokyo like storm clouds prod you to ponder some of the mysteries of modern-day Japanese life and culture. Then the insights hit you like gentle jolts of lightning. This film provokes your brain and heart." "A beautiful, evocative poem to Tokyo, like all cities a very complicated place...The film is rich in contrapuntal images - white-shirted businessmen and kimono-clad women, the blue tarps of tented homeless people and the sedate exoticism of Buddhist priests. Like the crow, the homeless woman is 'free' and can make her own meaning of life. The depiction of the coexistence of people and crows in the urban jungle favors neither but shows how city life can encompass nature and culture, urbanity and humanity and moves us away from dualities to more organic understandings of life--in Japan or anywhere." "Visually stunning...Even the mundane aspects of Tokyo life take on a fresh and often thought-provoking appearance. As its name indicates, this is a cinematic poem rewarding both those who encounter Tokyo for the first time as well as those already familiar with the city. Additionally, interviews with everyone from a Buddhist priest to a homeless woman provide further insights into a city at once similar to its Western counterparts and yet so different." "Tokyo Waka evokes through oftentimes stunningly beautiful images the textures of life in urban Tokyo, with crows as a recurring theme representing what many residents see as an intrusion of 'wild' and 'uncontrollable' nature. By eliciting appreciation for both untamed and domesticated forms of the natural world, the filmmakers convey a nuanced and poetic perspective that helps us see cities anew." "This elegant, intelligent film with breathtaking cinematography provides new ways of seeing Tokyo, its people, and the crows that thrive on its garbage. Tokyo's four seasons are shown from both bird's eye views and vantage points of people, a visual poetry that encourages us to contemplate the beauty and brutality of contemporary urban life...This memorable film, which encourages discussion about a known but rarely documented environmental issue, is perfect for high school and university classes on Japan, history, architecture, and global urban culture and is a must for library collections. It can reach people familiar with Tokyo and those who have never been to Japan." "Tokyo Waka depicts the real Tokyo rather than an idealized version...The film is full of interesting characters including people from all walks of life: From the stylish homeless woman to the philosophic Buddhist monk, the characters leave you wanting to know more about their stories...A very unique film that evokes vivid memories of Japan while making you think about life." "Tokyo Waka is an engaging window on life today in Tokyo and the part that crows have come to play in it. The film nicely conveys the well-known Japanese appreciation of and attachment to nature as well as the tenor of city life in Japan." "Excellent in storytelling and Zen in cinematography and sound design, this film is highly recommended to researchers and students who are interested in exploring the relationship between nature, animals and human beings." "A lyrical documentary...In this rapidly changing metropolis, crows are observed through various lenses referencing culture, society and art...Tokyo Waka is like a short encyclopedia on Japan following the theme of crows, showing the intricate survival of the fittest city dwellers." "Playful and meditative...[A] well-rounded look at some of Tokyo's most colorful and industrious aviary inhabitants. Recommended." "Portrays a captivating glimpse into the secret lives of crows and people. Highly recommended." "Although the film focuses on the changing relationship between humans and crows, it also offers an engaging depiction of Japanese urban life. Librarians and teachers of urban studies, zoology, and wildlife management could use the film for enrichment." "A richly varied portrait of a city...The crow proves to be highly photogenic, with its �ber-chic, glistening black plumage, endearingly eccentric, staccato walk and contrastingly graceful, gliding flight patterns. Its behavior, at once completely instinctive and thoroughly unpredictable, is an immeasurable boon to the raptly appreciative filmmakers." "[The filmmakers] have gathered a capital tangle of flock footage, anecdotes, and mad facts - 20,000 crows in Tokyo, sometimes attacking civilians, stealing coat hangers, and snacking on the zoo's prairie dogs! They've crafted this into an edifying whole, a film of beauty and revelation...Offers an intimate, oddly artistic look into a private world." "The movie's charm comes from showing aspects of the city that Western visitors usually miss or from viewing oft-photographed sites from unexpected angles. Haptas and Samuelson also play close attention to sound, capturing urban bustle, nature sounds and the way they overlap. Sensually as well as philosophically, Tokyo Waka is attuned to the textures of everyday life." In Japanese with English subtitles. Two versions on the same DVD: 63-minutes and 53-minutes, scene selection and SDH captions for the deaf and hard-of-hearing. "Lyrically meditative...The patterns of movement that weep through, horizontally and vertically, effectively capture the city's rythms...A rewarding ride for viewers." "Illuminates the spiritual interconnection between humans and nature in a mosaic of amazing photography. The film draws us into Japanese culture and the place of Tokyo with endless speeding trains and temples and gardens and always the crows." "[A] charming essay-film viewing Toko through an unfamiliar lens...Japanophiles and armchair ornithologists should be delighted_The filmmaker's interviews range from the purely scientific and informational to the profound." "Its makers shape an image of and ode to the eponymous city through an original and ruminative framework. Their methods and aims are to celebrate the multiplicity of human perspectives by probing various interviewees on the subject of their avian neighbors."